Annihilation is the follow up feature by Writer and Director Alex Garland (Ex Machina) and is loosely based on the acclaimed novel by Jeff Vandermeer. Actually loosely may be too strong of a word, because it does follow the premise closely enough and I think whatever liberties that were taken were appropriate for the cinematic adaptation of the novel. If you are looking for a straight adaptation I am afraid you would be better off reading the book, but do not let the fact that this is a visual interpretation of the story prevent you from viewing it because it is truly one of the best science fiction films of 2018 and like the book, the movie leaves certain things open to interpretation. In fact while Mr. Garland did not read the other two books that make up Vandermeer’s Southern Reach Trilogy, the film kind of stands well on it’s own so that neither media version is dependent upon the other. Vandermeer was very pleased with what Garland did with the movie and even goes so far as to state that Garland captured images he imagined while writing the book. The premise is similar to the short story Roadside Picnic, which itself was adopted into the feature film, Stalker in that in a remote portion of the South Eastern United States, something extraterrestrial has crashed and since then a zone referred to as Area X aka “The Shimmer.” This zone has been expanding since to the point that the clandestine vendor the government has assigned to study it predicts that the coverup put in place to keep people safe will be pointless as the shimmer expands to eventually engulf cities and so on. After using animals, drones, and military squads to explore it, nothing and no one has ever returned until a soldier (Oscar Isaacs) appears mysteriously within his home, startling his biologist wife (Natalie Portman) and after suffering sudden organ failure, the Southern Reach has a squad abduct both of them. There Portman’s character learns about the shimmer she agrees to join a group of scientists on an expedition inside to the source of the anomaly’s origins. 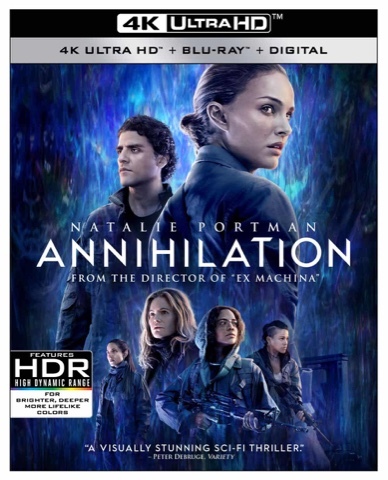 In 2160p 4K Ultra High Definition with High Dynamic Range, Annihilation is truly a Wonder to behold with beautiful rainbow like colors that give the film an almost psychedelic quality once they enter Area X. The 1920 by 1080p full HD presentation is also magnificent to behold although not nearly as vibrant. A limited time only redeemable code for a digital copy on an insert is also included within the Black BD Case. Both versions of the film feature a multi channel English Dolby ATMOS Soundtrack that is transparent so those without the ability to decode it can still listen to it using contemporary Dolby compatible equipment. I love how the soundtrack music by Ben Salisbury and Geoff Barrow sounds on it. I even own a copy of the score on iTunes. French and Spanish Language Dolby Digital Soundtracks are also included along with English Subtitles for the Deaf and Hearing Impaired as well as English, French and Spanish Language Subtitles encoded for both presentations on Blu-ray Disc. The extra value materials are a multi part documentary by Five By Five that covers the color palette for the film as well as cast perspectives on why they found the story so intriguing (25:15), the production design for the sets as well as the stunt work and visual effects used to create the world of the film (27:57), and a further exploration for the visual effects of the mandel bulb and reflections from the cast (19:43). These elements can be viewed collectively in three separate parts or individually. The film is divided into 18 scene selections and the menus are easy to navigate. Annihilation: 4K Ultra HD + Blu-ray + Digital Copy will debut on Tuesday, May 29, 2018 as a Best Buy exclusive. The Blu-ray and DVD + Digital Copy version and DVD version will debut on the same day at retailers on and offline courtesy of Paramount Home Entertainment.